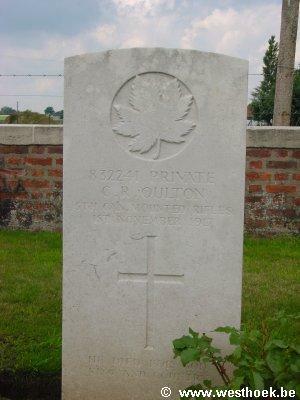 Private CLIFFORD ROBINSON OULTON 832241 5th Canadian Mounted Rifles (Quebec Regt.) who died on Thursday 1 November 1917. Age 15. 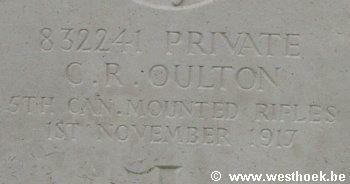 Private CLIFFORD ROBINSON OULTON 832241 5th Canadian Mounted Rifles (Quebec Regt.) who died on Thursday 1 November 1917. Age 15. Son of Dora and the late George Oulton, of Coverdale, Albert Co., New Brunswick. NINE ELMS BRITISH CEMETERY Grave VIII. F. 15.